BÜNTING - Asia secunda pars terrae in forma Pegasi. BÜNTING, H. - Asia secunda pars terrae in forma Pegasi. Asia secunda pars terrae in forma Pegasi. - BÜNTING, H.
Title : Asia secunda pars terrae in forma Pegasi..
Map maker : BÜNTING, H.. Date : Magdeburg, ca. 1579. Size : 9.8 x 13.8 inches. / 25.0 x 35.0 cm. 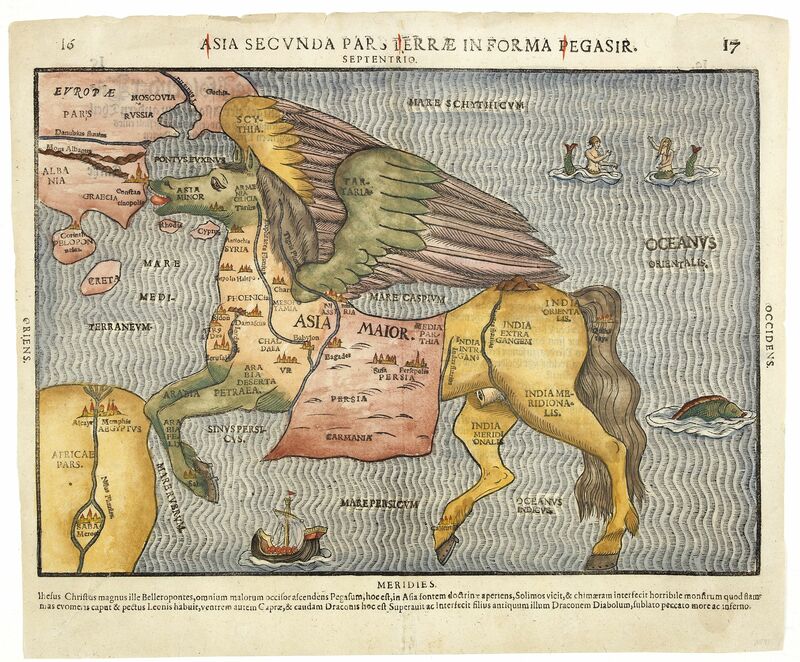 Description :Wood block map of Asia in the form of a Pegasus. The seas are adorned with sea monsters and many major cities are indicated and named. There are several states, of this map. Some marginal tears in lower margin reinforced. German text on verso. Bünting's work Itinerarium Sacrae Scriptura was essentially a theological commentary with other maps of great curiosity. The title of this map is Asia Secunda Pars Terrae in Forma Pegasi (’Asia, the Second Part of the Earth, in the Form of Pegasus‘). The winged horse of Greek mythology is the son of Poseidon and Medusa, was tamed by Athena and became the horse of the Muses. This obviously pagan origin of the image makes its appearance in a Holy Land travel book a bit of a mystery. On this map, Pegasus is drawn realistically – i.e. Asia is adjusted to horse-shape. - Asia’s front legs, touching Africa with the knees, constitute Arabia. - Its head, licking Europe, is Asia Minor (present-day Turkey). - The Tigris and Euphrates rivers run down its neck, on which is marked the area of Mesopotamia. - Another river indicated, at the horse’s thigh, is the Ganges, with India Infra Gangem (‘India before the Ganges’) to the west and India Extra Gangem (‘India across the Ganges’). - The horse’s behind is India Orientalis (’East India‘, which could be used for parts east of present-day India, e.g. Indonesia, formerly the Dutch East Indies). - Both hind legs are inscribed with India Meridionalis (’South India’), which doesn’t at all reflect the single-peninsular nature of the Indian subcontinent. - The wings are labeled Scythia and Tartaria, names often used to describe the vast unknown areas of Siberia. - The body of water in between the wings and the horse’s body is the Caspian Sea. Hill p.39; Suarez Fig. 54; Tooley, MCC-1 # 3; Yeo #8. Condition : German text on verso.